NEW BEDFORD-Mary J. Cordeiro, 100, of New Bedford, died Monday, February 4, 2019 at New Bedford Jewish Convalescent Home following a period of declining health. She was born in New Bedford, the daughter of the late Manuel and Maria N. (Jesus) Martin and the widow of Mariano Cordeiro. She was formerly employed as a stitcher for Paul Modes and Albetta Dress Factory. Mrs. Cordeiro was also a hairdresser. She was a communicant of Our Lady of Mount Carmel Church, where she taught CCD for many years. She was also a member of the Mount Carmel Seniors and the Dartmouth Seniors. 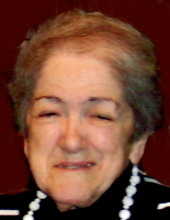 Sister in law: Cecile Cordeiro of New Bedford; Niece and caregiver: Dorothy M. Foster of New Bedford and numerous other nieces, nephews and Godchildren. Mrs. Cordeiro was predeceased by several brothers and sisters. Her funeral will be conducted Monday morning, 9:30 at the funeral home, with a Mass of Christian burial to be celebrated in Our Lady of Mount Carmel Church at 10:30. Visiting hours Sunday afternoon from 3:00-6:00. Interment in St. John Cemetery. Funeral arrangements entrusted to AUBERTINE-LOPES FUNERAL HOME, 129 Allen Street. Expanded lighted parking area with handicap accessible entrance to rear of funeral home. For online guestbook, directions and additional information, please visit www.aubertine-lopes.com. To send flowers or a remembrance gift to the family of Mary J. Cordeiro, please visit our Tribute Store. "Email Address" would like to share the life celebration of Mary J. Cordeiro. Click on the "link" to go to share a favorite memory or leave a condolence message for the family.